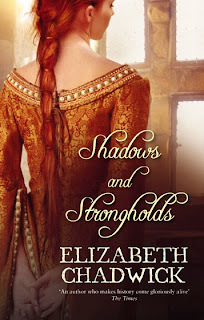 Some years ago, I received as a part of a book ring Shadows and Strongholds by Elizabeth Chadwick. I didn't know the author, but the shallow part of me was in complete awe by the book's cover who was completely mesmerizing: the colors, the young woman's hair and the fabric of the dress were perfect eye candy. Back then, I was desperately looking for medieval historical fiction and since some of my friends who read her first books recommended her warmly. I was impatient to start! With Shadows and Strongholds, she captivated me to such high level that I knew instantly that I needed to buy all her back list. I didn't read them all...yet, since I'm saving some of them for special moments when I need to read something good, a story that I'm sure will leave me with a smile on my face and a sensation of fulfillment that only happens with our favorites authors. It is not easy to find an author capable of creating characters (or even bringing back to life historical personae) who feel real and who react according to the times they lived. This combined with a rich historical research makes a powerful and attractive combination to all the fans of that specific historical period. After reading several of Chadwick's books, I never miss to enjoy how she always manages to get the right balance between the characters story and the historical context, which is truly an amazing talent. The only time I doubted I would actually like one of her books was when I read the synopsis of The Daughters of the Grail. A heroine descendant of Mary Magdalene who has some paranormal powers?! I started reading with some apprehension... And then, again, Elizabeth Chadwick showed me how talented she is. I couldn't help but feel with the heroine, suffer with the hero and my heart broke when I knew what fate was waiting for both of them... Her vivid descriptions of the South of France and the Cathar world brought me back wonderful memories from when I lived there a few years ago. Some time after Daughters of the Grail, I met William Marshal. I think I never recovered from that encounter. This is the man who caught me completely unaware with his charm, honor and charisma. During 560 pages I felt like I was part of William's entourage, following his adventures and life through the troubled times of the reign of Henri II of England. Even now it's hard for me to talk about him, he is such a complex man and someone who easily becomes the subject of all your admiration. I willingly admit my jealousy towards Isabelle de Clare, his young wife. I want William just for myself and no sharing! The Greatest Knight became one of my favorite books of all times. Elizabeth Chadwick is an outstanding storyteller. Each one of her books brings you back in time with heroes and heroines from all kinds of social backgrounds who despite their personal flaws always awake admiration for their bravery and honor, but also by their fragility and most of all, humanity. Hello, my name is Alex and I'm an Elizabeth Chadwick-oholic. My name is Daphne and I'm an Elizabeth Chadwick-oholic. Is there a twelve step program somewhere?! I am an Elizabeth Chadwick-oholic as well, but to be honest, I don't actually want to twelve step program to help me with my "problem". I am quite happy to continue in this manner for many years to come! I am new to even hearing about Chadwick. Is there any particular book you would recommend that I read first - you know, to get my feet wet, lol? 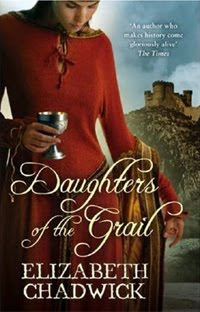 I love historical fiction set in the medieval period as well. As I'm going to keep an eye out for Chadwick's books, can I hear some suggestions for a good one to start with? I too am a Chadwick-oholic. However, I don't want a twelve step program to cure me of my addiction. I want more. Elena, where to start? The Marshal books are awesome, but Shadows and Strongholds is still #1 with me. Hello, I am Elizabeth Chadwick, and I would like to thank all my lovely readers for keeping me in a job! Alex, I am only half-inclined to fight you re William. Dare I confess it. Much as I love, honour and adore William Marshal to pieces, his father is the man who stole my heart! I too am an Elizabeth Chadwick-oholic!!! So much so that when I discovered The Champion missing from my bookshelf, I was very upset! Still haven't tracked it down. I have most of her books and hope now they're being re-released, to complete my collection. Like you I LOVE the way she takes you back in time - I lose myself completely in the world she creates. Oh, to have such talent! It sounds like she's a writer not to be missed. I will have to look up some of her books and give them a try. I'm with Misfit, The Greatest Knight or Shadows and Strongholds are wonderful starts, they are my two top favorites also. I'm also waiting for the The Running Vixen and The Leopard Unleashed. A good friend of mine lend me her copies of the Ravenstow Trilogy a couple of years ago and since then I've been anxiously waiting for a re-release. You won't regret it, I'm sure! Oh Alex, maybe this is why I haven't picked up a EC book yet. I'm afraid of another book addiction. LOL!